As an applications engineer at EDAX, I have the opportunity to work with many different people on a regular basis. Each person I meet has his or her own unique reason for using our microanalysis systems. At one recent event I was able to work with Dr. Nigel Kelly, an assistant professor from Colorado School of Mines. Besides bringing his great Australian accent he also brought an interesting geological specimen to study via EBSD: a single embedded Zircon grain. While this might not seem exciting to someone with a background dealing with polycrystalline metals, the remainder of this post will use EBSD data to demonstrate otherwise. To begin understanding why the Zircon specimen was fascinating enough to deserve its own blog post, I will provide a brief background on the sample. 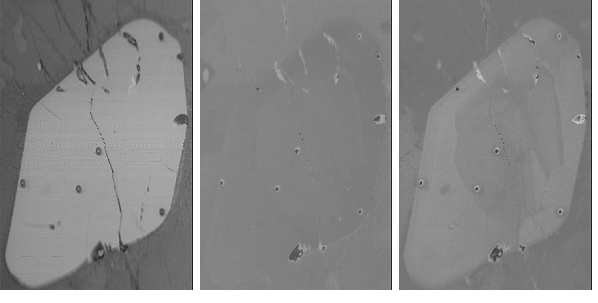 Before being extracted, mounted, and polished, the observed grain (BSE and IPF image shown above) was subjected to the presence of Uranium by natural causes. 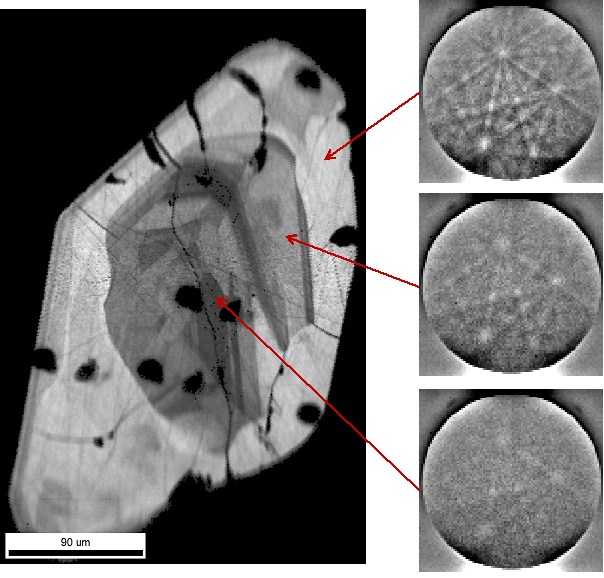 The exposure to radiation caused crystallographic changes in the grain which were manifested as deformation within the grain. Crystallographic deformation has long been observable by EBSD and so this particular specimen seemed well suited for the technique. 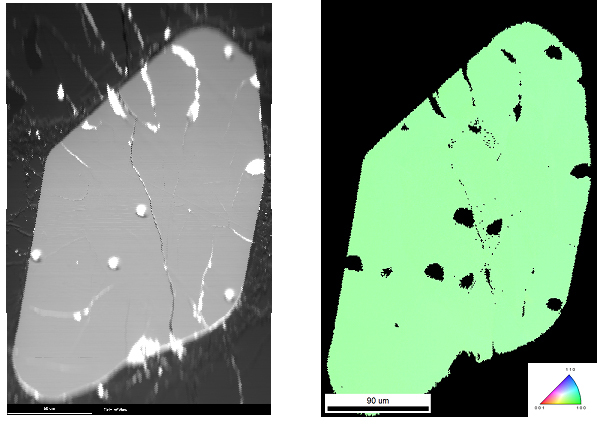 EBSD offers many metrics for measuring and quantifying deformation in a crystalline material. Research has shown the usefulness of both image quality (IQ) and local measures of misorientation (kernel average misorientation (KAM), grain average misorientation, etc.) in obtaining this information via EBSD. Each of these metrics is important depending on the magnitude and length scale of the deformation present in a specimen. where N is the number of measured Kikuchi bands used and H is the value of the Hough transform located at peak (p_i,θ_i). Typically maps of IQ are used like images obtained from traditional metallographic etching under a light microscope to reveal grain structure (see below). The darkest areas are indicative of grain boundaries. This occurs due to mixing of patterns at grain boundaries which causes a reduction in the intensity of all reflected Kikuchi bands. While this phenomenon is manifested at grain boundaries it can also happen for other reasons. Those causes are generally on the length scale of the electron interaction volume, so anything that affects the crystal structure with a ~100 nm radius of the scan point could manifest itself in the IQ map. Below is the IQ map of just the Zircon grain coupled with a few EBSD patterns (96 x 96 pixels) from indicated regions. Conversations with Dr. Kelly revealed that the variations in image quality in this sample point to metamictization within the grain. Metamictization occurs in the grain due to the presence of Uranium which causes the crystal to become amorphous. As the crystal structure degrades so do the EBSD patterns and associated IQ which can be seen above. The metamictization seen via the IQ maps is not the only detectable deformation mechanism that is present in this specimen. Other measures of local misorientation show subtle changes in orientation at discrete zones in the grain. For this specimen two conventional measures were used along with one novel metric. The first misorientation map below shows the KAM which has been a traditional measure of plastic deformation in crystals since the early days of EBSD (i.e. before my time). In the KAM map there are a few distinct regions of higher values which indicate subtle changes in crystallographic orientation often associated with increased dislocation content. The second maps show the grain reference orientation deviation (GROD) angle which is displays the misorientation angle of a point from the grain’s average orientation. With this map we get a different perspective of the deformation in the sample. Additionally, the misorientation angles are all less than two degrees so the visible plastic deformation is really quite small. Finally, the new metric used on this sample was a GROD axis plot. Previously, deformation only focused on the angle of misorientation since these measures could be readily correlated to % plastic strain values. However, the addition of mapping the axis reveals the deformation zoning in a sample which might not otherwise be visible with traditional measures. While the KAM and GROD angle maps provide quantitative values on the degree of deformation in the Zircon grain the GROD axis map shows the subgrain structure. In the words of Dr. Kelly, “The GROD maps show nicely the sub-grain rotation that is occurring. But what I find cool is that it is radial – the higher U core compared with rim causes differential expansion of the two domains, the core expanding greater than the rim causing radial fractures” (now reread that in your mind with an Australian accent for better effect). These radial fractures can be best seen in the BSE image at the beginning of this blog and the GROD axis map. The maps used in this blog to show various modes of deformation are a subset of all possible measures. PRIAS imaging was also used on this sample and showed several types of information including compositional difference, topography, and orientation/deformation contrast (see below). 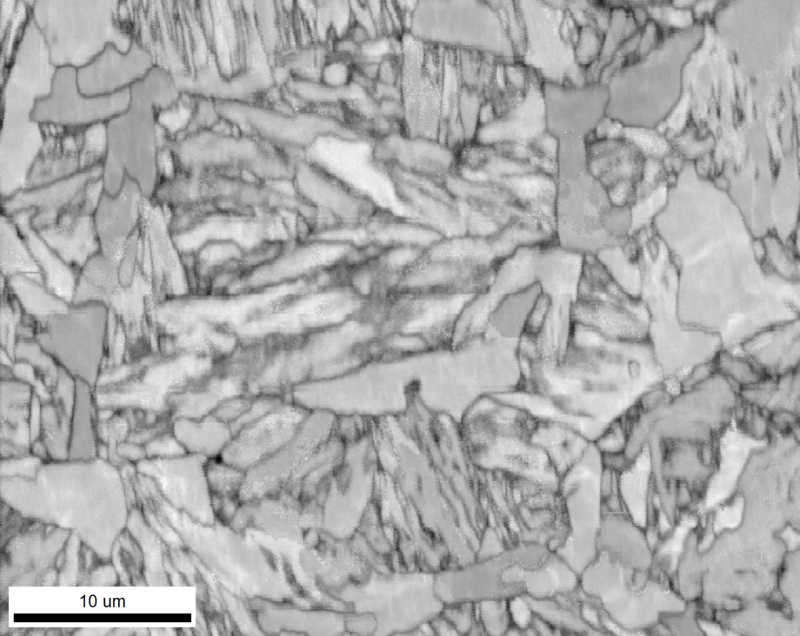 With all of the types of deformation that can occur in a sample it is nice to know that EBSD provides several metrics for extracting each bit of that information.